New York State representatives were on hand at View to talk to members of the public about proposed changes to the Adirondack Railroad Corridor between Remsen and Lake Placid. The corridor known as the Remsen-Lake Placid Travel Corridor (RLPTC) is governed by a Unit Management Plan (UMP) that was last updated in 1996. This entry was posted in admin and tagged DEC, meeting, rail corridor on October 30, 2014 by Jay Lawson. 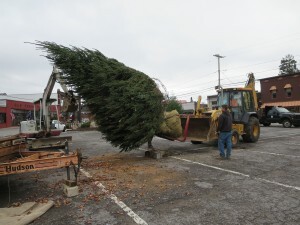 A 15-foot White Spruce tree planted at the northern side of Old Forge’s Point Park on Friday, October 24 will serve as the village’s permanent Christmas tree. This entry was posted in admin and tagged Christmas Tree, Permanent, point park on October 30, 2014 by Marianne Christy. Town of Webb Supervisor Ted Riehle gave an overview of the town’s Preliminary Budget for 2015, at a public hearing held on Tuesday, October 28 in Old Forge. This entry was posted in admin and tagged town budget, webb supervisor on October 30, 2014 by Jay Lawson. The annual Consignment Sale to benefit the Polar Bear Ski Club will be held Saturday, November 8 from 8 a.m. to noon at the McCauley Chalet. All winter sporting equipment including clothing, nordic and alpine ski equipment, boots, outerwear, and ice skates can be dropped off for the sale at the chalet from 5 to 7 p.m. on Friday, November 7, or from 8 to 9 a.m. the day of the sale. Twenty percent of all goods sold will go directly to the Polar Bears. This entry was posted in admin and tagged Consignment Sale, McCauley, Polar Bear Club on October 30, 2014 by Gina Greco. The Forestport Town Board has agreed on a Preliminary Budget for 2015 that features $126,423.81 in savings over the Budget that was adopted in 2014. If cutting government cost was easy, everybody would do it right? I commend our Town Board for making these tough decisions that move our town toward greater efficiency and savings on behalf of our taxpayers. This entry was posted in admin and tagged Forestport on October 30, 2014 by Parker Snead. Area polls will be open from 6 a.m. to 9 p.m. for the general election on Tuesday, November 4. This entry was posted in admin and tagged election, town judge on October 30, 2014 by Marianne Christy. The Town of Webb School’s Senior, Junior, and Stage Bands will be performing in their first concert of the school year in the TOW School gymnasium on Thursday, November 6 at 7 p.m. The students will be under the direction of Instrumental Music teacher Emily E. Herrmann. Musical selections will include National Emblem March, Kentucky 1800, Sing Sing Sing, Land of Make Believe, Fighting Falcon March, and George of the Jungle. Students need to be in the band room by 6:30 p.m. Senior Band will wear all black and Junior Band will wear black bottoms and white tops. The community is invited to come out and support the students. This entry was posted in admin and tagged band concert, town of webb school on October 30, 2014 by Gina Greco.